Working from home or starting your own business are employment trends on the rise. For most people, these start as side businesses – ways to make extra income or to make your hobbies more productive. But the desire to turn it into a full-time gig is strong. Just imagine: Work that you choose, a schedule you set yourself, a paycheck you control. Who could resist? A few years ago, I was content with my life. I was happily married with two amazing kids. I was surrounded by my warm, extended family. I worked two jobs, both family businesses. One was a pipeline business with my husband, and the other was a guest house with my mother. When I stumbled across Traveling Vineyard, a direct sales wine company, I thought it was a perfect short-term opportunity. I had been invited to a wedding in Italy, and a little extra income would make the trip not only possible but special. But what started as a whim, soon became a job. And, 18 months later, I decided to turn that job into a career. I’ve made the transition into full-time self-employment, and I couldn’t be happier. 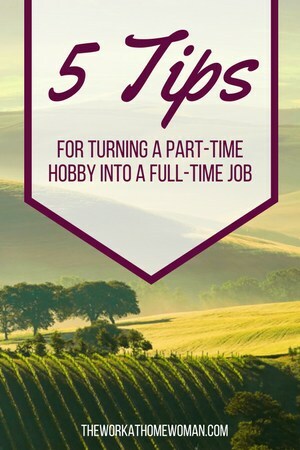 Here are my five tips for turning a part-time hobby into a full-time job. I knew I was ready to make my direct selling career my full-time work when my younger son climbed into my lap and said he wished that I could just sell wine, so I had more time to snuggle. Until then, I’d been thinking of it as a great side job. I loved the work and found my successes invigorating, but soon I wanted more. My kids are growing up and pretty soon they won’t want to snuggle anymore. If there was a way to maximize my time with them and still have a job I liked, I was going to take it. With family as my motivating force, I was able to set clear goals for my business which, in turn, helped smooth my way to success. 2. Be sure you have the right job. I knew I could make this entrepreneurial endeavor a full-time gig for a few reasons. The first was the company itself. I’d found an organization that was tremendously supportive of its people, with a strong business model, a clear path to growth, and plenty of incentives along the way. But most importantly, it was a job that I loved doing. In this particular direct sales gig, I got to learn about wine – something I loved, pass that knowledge onto other people – something I found interesting, meet and chat with new people – something I found fun, and watch my efforts bear fruit in my business – something I found empowering. When your job also doubles as your refreshing ‘me-time’, you know you’re on the right path. 3. Get your support system on the same page. Even with my enthusiasm and early successes, I know that I couldn’t have done any of it without the backing of my nearest and dearest. Part of that, of course, was because I worked in two family businesses. But with their blessing, I found replacements (as much as we like to think something can’t go on without us, they really can) and growing my direct sales business has helped me replace any lost income. Mostly, it is because of this simple fact of life: Change is hard. Having a cheerleading team eases the burden. My family sees how much happier I am, and they’ve been an amazing support system as I pick my way through the challenges that come with any new venture. For me, the hardest part of making the transition was figuring out how to use my time. It’s just as easy to go overboard with work as it is to luxuriate in a sudden abundance of free time. Figuring out the best way to maximize my family time while growing my business has been my biggest challenge. It’s also been my biggest reward. Setting my work schedule means that I can adjust the load to do things like summer 4-H club with my boys without disrupting the momentum of my business. Once I decided to make the leap, I realized the only way it was going to happen was if I made it happen. You figure out your priorities, you talk to your family, and you look at your financial and current job situation. You can plan and plan and plan. At some point, you have to stop planning and just do it. I threw my hat into the ring by announcing my intentions at a regional meeting for Traveling Vineyard, creating an entire system of accountability for following through in one stroke. And then I made the leap. I have no regrets. Jonelle Swiger is a Ruby Director with Traveling Vineyard. She is a busy wife and mom to two active boys. She loves to garden and have friends over on a regular basis for cookouts. There is always a trip on the horizon for Jonelle as travel and photography are two of her passions.